The RHT floor panel system provides an easy, fast, and effective way to attach, guide, and install your PEX tubing effectively and cleanly. This system is designed to be used with ½" RHT PEX tubing. It features specially machined 180° turns, making installation a breeze. 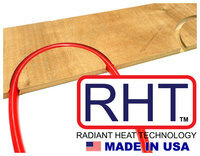 The RHT Floor Panel System also comes with custom heat transfer plates, which help secure the PEX tubing in their omega shaped (Ω) channels while allowing for a more efficient energy transfer, ensuring a more efficient and cost effective heating experience. Click here to see a step by step installation.